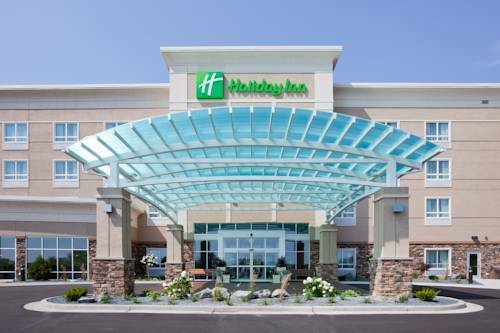 Welcome to the IHG 2016 Torchbearer Award winner Holiday Inn Eau Claire South I-94 hotelThe new hotel is conveniently located off I-94, near Hwy 53 and Hwy 93, making Holiday Inn Eau Claire South I-94 the right choice in Eau Claire, Wisconsin. The 130 non-smoking spacious rooms and suites are designed in a modern contemporary scheme for comfort and a relaxing atmosphere. Special amenities include free Wi-Fi access, a 24-hour Business Center, relaxing outdoor patios and fire pits, an indoor pool, whirlpool and a complete Fitness Center. With over 3,500 square feet of striking banquet and meeting room facilities, the hotel is equipped with state-of-the-art features conducive to meetings, receptions, weddings and other social gatherings.Guests will be able to enjoy dining excellence at Johnnys Italian Steakhouse. Johnnys is a personification of its mantra hot steaks, hot music, hot Italian cool place! It blends the traditions of the past with the present by adding a touch of class with a lot of edge. Eau Claire is home to the Mayo Clinic Heath System, University of Wisconsin-Eau Claire, Chippewa Valley Technical College, Globe University and the Oakwood Mall shopping district. The hotel has beautiful meeting room facilities equipped with state of the art features conducive to meetings, banquets, wedding receptions, holiday gatherings, conferences and other social gatherings. ~41 miles from Eau Claire.